7976 Glenfinnan Cir Fort Myers, FL. | MLS# 219004436 | Southwest Florida Residential Real Estate for Sale. 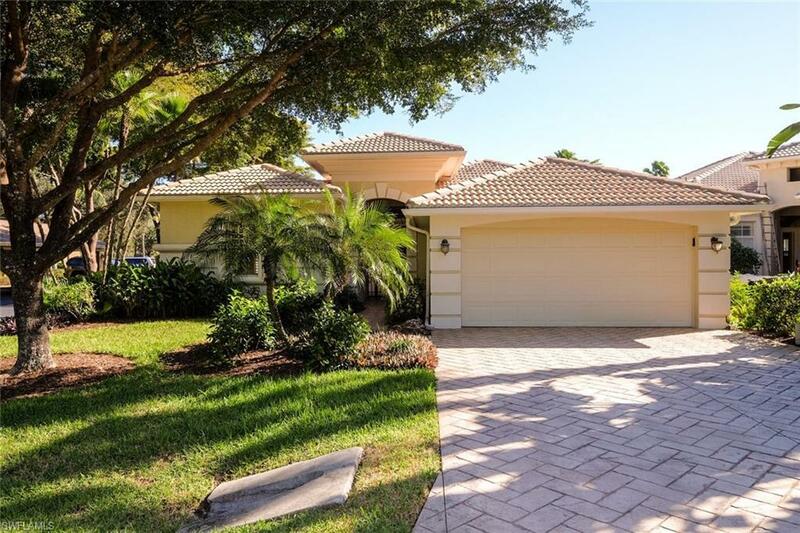 Great opportunity in Fiddlesticks country club on this 3 bedroom, 3 bath POOL home with 2 car extra deep garage and separate cabana which is great for guests or an in-law suite. Home is situated around private pool area with access from most every room. Pool has waterfall feature, built in cocktail table, new pump and three year old pool heater. Bright open kitchen has ALL BRAND NEW STAINLESS STEEL SAMSUNG APPLIANCES, brand new washer & dryer, 42" wood cabinets, breakfast bar that is open to the family room. Master bath has large garden tub, walk in shower, dual sinks. Home also features surround sound w/ outdoor speakers, plantation shutters, tile floors, double French door entry, paver driveway, extra large storage closet, secondary outdoor space off the back of the home with plenty of room for expansion. 5 ton AC SYSTEM with wireless thermostat installed April 2016. All new super screens installed fall 2017, new pool pump fall 2017, new outdoor light fixtures 2019. Fiddlesticks is a private equity golf community with 36 holes of golf, practice facility, clubhouse, lighted tennis courts, NEW Pool & Cabana. Equity membership due at closing. Own your own golf cart here. Copyright 2019 Multiple Listing Service of Greater Fort Myers and the Beach, Inc.; All rights reserved. The data relating to real estate for sale on this web site is the copyrighted and proprietary database of the Multiple Listing Service of Greater Fort Myers and the Beach, Inc. The properties displayed may not be all of the properties in the MLS\' database, or all of the properties listed with Brokers participating in the cooperative data exchange program. Properties listed by Brokers other than Royal Shell Real Estate are marked with BR logo and include the name of the listing Brokers. Information provided is thought to be reliable but is not guaranteed to be accurate; buyers are advised to verify facts before making the decision to purchase a property. No warranties, expressed or implied, are provided for the data herein, or for their use or interpretation by the user. Information provided is for consumer\'s personal, non-commercial use and may not be used for any purpose other than to identify prospective properties consumers may be interested in purchasing. This site will be monitored for \'scraping\' and any use of search facilities of data on the site other than by a consumer looking to purchase real estate, is prohibited. Listing broker has attempted to offer accurate data, but buyers are advised to confirm all items. Information last updated on 2019-04-22.